4:30am once again found us stumbling around and getting ready to depart for the bus station. Everyone was awake (it was a full moon) and we were seen off by Deidre, Wague and Hossein. The bus left very close to 7am (on-time!) 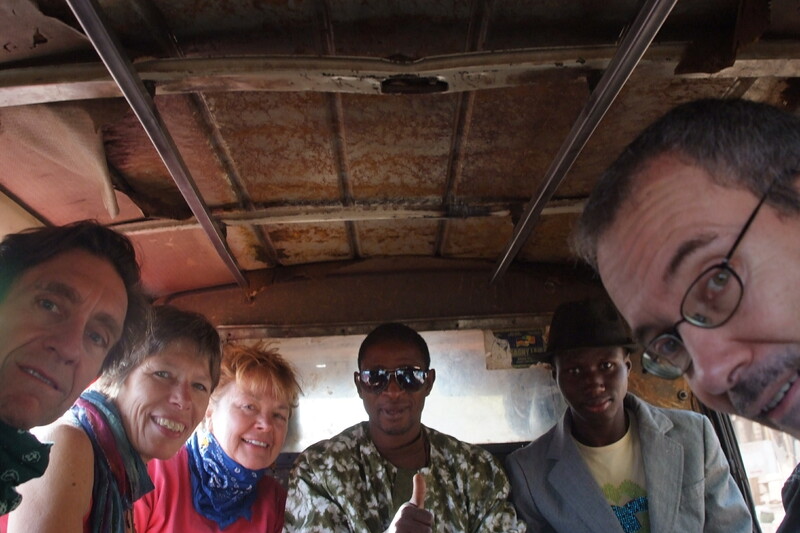 and 9 hours later we were in Mopti taking a cab to Sevare and Peace Corps Baba’s shop. It was a very weird weather day. Overcast, dusty (the sun was not visible at all) and cold. It was the Harmattan, a wind blowing South from the Sahara http://en.wikipedia.org/wiki/Harmattan and it was miserable. At Mopti, near the Niger river, it was almost like a sea mist mixed with dust. The evening meal, taken outside (as is the case with most local restaurants), was a cold affair and it was nice to be all tucked up in my sleeping bag later that night. It was only a 3 hour car ride to Sanga, the capital village of Dogon. The ride was asphalt until Bandiagara and then a surprisingly well kept dirt road to Sanga. Unlike other unpaved roads we’ve been on, this one was quite passable and maintained. The closer we got to Sanga (i.e. the further we traveled off the beaten path), the nicer the road(!). The bridges were of sound concrete with dressed stone buttresses and supports and the road was lined with dressed stone curbs. The road surface itself was at times just the solid underlying rock of the area. We were approaching the Bandiagara escarpment (the Dogon call it Coco). The Dogon moved into this area in the 14th century, displacing the Tellem (not gently either) who had inhabited the cliff face for centuries. The Tellem were a small people (pygmies) and built most of their structures directly into the cliff face hundreds of feet off the valley floor. The Dogon, in contrast, built most of their structures on the plateau above or directly at the base of the cliff for easier access to farm land. The Tellem stone work was primitive in comparison to the Dogons’ more refined stone based construction tradition, and they tended to use more mud than rock to seal the mouth of their cave-like dwellings. The Dogons’ knowledge and skill of stone construction is very high. At times it was similar in feeling to the stone vernacular I explored in Northern Italy, though the forms of the buildings are obviously of different character. Dogon, compared to Bamako and the mud vernacular seen elsewhere, seems more solid to the touch and more rooted to the ground. The villages are laid out according to informal principles, and organized around the topography and a main square. All of the dwellings are of a courtyard typology, abutting each other, with small lanes (some no wider than 3 feet) for passage. It is easy to get turned around here, but out guide, Seck Dolo, is Dogon, and this is his home village. Rather than getting lost, we were more apt to get pulled into a house to see local life. We were able to see the Hogan (village elder), and the Ogotemly’s (hunter and medicine man) house. We were also able to see Seck’s mother and father, the menstrual huts, many granaries, and of course, the Taguna. The Taguna is a low ceilinged structure with an amazingly tall roof made from overlapping wood logs, branches, and reeds. The Taguna is used for hashing out quarrels and for meetings where it is important to reach consensus. The low ceiling is to keep people sitting in a more submissive posture and prevent them from rising up in anger. The landscape here reminds me of the American SW. The high plateau, where sits Sanga, has many minor (5 feet to 30 feet) elevation changes. Eleven villages comprise the main village of Sanga and the handful that are located on the plateau (the rest are at the base of the cliff) are organized on and around these elevation changes. We were able to see three of the plateau villages; Ogolay Tabda, Ogoda, and Bongo. We had a very nice place to stay that night; open air, clean and with a good supply of beer and soda. The food was filling and a pleasant night was spent on the plateau. We started our descent in the village of Bongo, walking through a natural tunnel and emerging at the trail head. Our walk down the cliff face passed by in a blur. I was a child again climbing over rock falls in North Carolina, a young man in Big Bend, Texas climbing around Boquillas Canyon, and as a wizened dude just a few years ago spending 5 days in the Mohave desert clambering over outcrops and through dry washes hunting for the perfect building site for a new BLM visitor center. And now, on this day, on the Bandiagara escarpment in West Africa, I was falling again in love with this landscape. Above me a basalt plateau, below, the plains of Africa stretching South to the heart of the continent. And here, on the vertical face that for this day was my clung-to home, all the reasons I had so many years ago for almost becoming a geologist came flooding back. Combined with my love of exploring new-to-me cultures, I was indeed in bliss. The cliff in this area was over 1000 feet tall, shear and broken only by carved trails down to the valley floor. The horizontal striation of the face gave the inhabitants a starting place for the trails and connect the many villages vertically. We shared the trail with a line of villagers from below (mostly women) coming up this steep and not untreacherous path. They were loaded with goods for the market in Sanga above and, of course, were carrying everything on their heads. It reminded me of Garrison Keilor’s description of Lake Wobegon where the “women are strong, the men good looking, and the children all above average”. The women are incredibly strong here (and I must admit, very beautiful as well). The cliff base was reached all too soon however, and although a bit sad, I can now write with fewer metaphors. We left the cliff base via the village of Bananey and passed again into the Sahel. Walking on the flat of the scrub foliage and dry farmland was surprisingly no less spectacular than the cliffs, but inward focused. It was quiet with the just the occasional blat of a stray goat to break the silence. My mind wondered as I took in the different landscape and smells, trying to put into past experience this walk. I couldn’t do it. To just stop and look out over the landscape and imagine the rest of Africa stretching before me ……. We passed the village of Baegue on our walk to our stopping point of Irlle. We arrived in Irelle in the afternoon and had a rest on the covered roof top of this evening’s shelter. Back on our feet and walking again by late afternoon, we headed up the cliff face towards upper Irlle and a closer look at the Tellem houses above. We are allowed to the base of the escarpment and within site of the ancient Dogon structures built into the rock. These houses are not generally occupied and are in various states of disrepair, though the cliff shadow has protected them from most of the typical rain damage you see on the flats of the plain. Above these original Dogon houses sit the Tellem dwellings. These little houses are actually nestled into the cliff along the horizontal strata. They are tiny houses and some are 400-500 feet above the cliff base; accessible only by rope and ladders. Besides houses, the Tellem strata also hold many shrines and burial caves. Because of this, we are not allowed to climb into the Tellem area; which is probably a good thing as I would have gotten myself into trouble getting into places I had no chance of getting out! Unfortunately (fortunately?) we didn’t go. The village between Irlle and Amani, Yeye, had an annual fetish day (all of Dogon is animist) sometime this month. No one knew which day of the month this was going to happen, but the whole of Dogon was alert and no-one was going to, or past Yeye until the fetish day had past. The villagers of Yeye spend the day fishing in the lake, bringing power to the village by the active worship. If a stranger happens upon this scene, a fish is thrown at them to indicate they are to help with the fishing. Afterwards, the poor slob is sacrificed. The Dogon say that even if you run away and don’t stick around to be offed, the magic is strong enough that you will still drop dead. So, facing a journey of fish throwing (not to be confused with Monte Python’s fish dance), curses and powerful magic, only to be eaten by a croc at our destination, we decided to go back to the cozy rooftop camp and join the village later that night to watch Mali in the Africa Cup Semifinals. It was interesting to be in the middle of nowhere (literally too, this was the first time in all of Africa – and that includes Timbuktu – that I had no bars of service on my cell phone!) and watch the villagers hook up the 16” color TV to an inverter and a car battery, somehow get a crystal clear signal in the middle of a school yard in the middle of nowhere, and watch Mali lose a heart breaker to Cote d’ Ivoire 0-1. To my folks … Happy 55th anniversary!!! Waking early, we eat a hearty breakfast of …. Donuts!!! (flour deep fried – a staple of every culture I’ve had the pleasure of exploring) … and green hibiscus and fish (the green hibiscus is sweeter than spinach or kale). At the end of the meal, mama brings out the green millet cakes for me to pass out to the children. Why you ask? Back in Sanga, on the first day of our journey through Dogon, we visited the village seerer. The outcome of my reading was good, but she did say I needed to make a sacrifice to the children by passing out millet cakes to them. Believe what we may, I chose to see the parallels with my inability to know how to treat the children I see on this trip. I’ve blogged about it earlier and although I love to interact with the children and play with them and walk with them and hold hands …. They need money and food and help. Wrestling with my very Western concept that we all need to first help ourselves and we shouldn’t just give handouts (and yet all the guides and locals say the same thing) and my inability to know what the hell to do, passing out Millet cakes just seems like a good thing. And what a fun thing it was! Kids were coming out of the woodwork and 50 Millet cakes were gone in minutes. When done, the children reached into the bowl and blessed the food. It was very heartwarming, even if it was not a spontaneous event. Off to the cliff face, we watched a couple of older men climb to the first level of the Tellem houses. No amount of pleading on my part got me any further up the cliff and I had to be content with waving to them from the bottom. Leaving there, we started the steep ascent to the plateau. We used a natural wash as our rock ladder; it was steep and we were at times on a narrow ledge with a 200 foot drop at our backs. This was definitely THE adventure on this trip. All too soon we were safely into a hanging valley and the start of the plateau and the farm land of upper Sanga. Tellem houses followed us all the way up the dry wash until we were nearly at the top and the bald rock of the plateau. We passed through the first upper village of Barou and were soon again collecting the stuff we left behind, eating lunch, and getting ready for the drive back to Sevare. Our last stop on the plateau that day was to visit one of the families that does the indigo cloth dying. We saw the vats of dye in all stages, from the dried acacia leaves to the boiled and finished dye that has been set with phosphate. The finished cloth is an amazing piece of hard work. All areas of the cloth that are desired to remain white are sewn up in intricate patterns with tens of thousands of stitches to prevent the taking of the dye. The cloth is soaked in the dye (sometimes numerous times) and then the seams are ripped. This dyed cloth, along with the Bogolon cloth of the Bambaran, stand up beautifully to the landscape and the people of Mali as one of its great treasures. Leaving Sevare’ on the way to the Dogon area. Note the Dust from the Harmattan! the absolute coolest roof scuppers ever; Crocodile carvings! grinding the onions; you could smell them throughout the village. the inside of the Baobab fruit. A Catholic church …. here? Joyce was very very happy to get to the top of the climb! Made it safely back to the paved roads once we reached Douentza. The remaining portion of the trip to Sevare passed in blissful smoothness. We arrived at Peace Corps Baba’s shop in the late afternoon and we all treated ourselves to a nice, cold shower. Refreshed, I spent our remaining light measuring Peace Corp’s building. And I’ve never measured like this before. Knotted twine and a tailor’s tape my instruments; a cadre of enthusiastic children ages 3 to 12 my assistants. To be honest, once we worked out a system, it was a pretty smooth operation. Never have I had as much fun doing such a normally thankless task! At dusk, we stopped the measuring and Joyce, Larry and myself went out for a delicious meal at a restaurant down the road. Fish, beef, spaghetti, beer, soda …. You name it, we had it. I think we felt like celebrating after the drive from Timbuktu. Deia joined us, along with “Pierre Cardin”, a local tailor with a self given moniker. He makes a great shirt and his signature “air-conditioned” pants (pants that are split down the inseam and tied on so you have an open inseam on both legs). It was a relaxing evening and a sound sleep. Woke up refreshed and jumped back into the measuring of the building with my apprentice crew. We were done by 9:30am. Not bad; only took 5 hours from start to finish. I bought a most beautiful purple and iridescent blue wedding blanket from a street vendor outside the shop, we said our goodbyes for now, and jumped into the 4×4 for the trip to Djenne. We’ll spend the day exploring the mud architecture in Djenne, as well as its weekly market. We have one night there and will be back in Bamako the following night. We are done with the sand of the Sahara and back in the grass steppes and stunted growth of the Sahel. The soil is red again and the built environment is familiar laid-up mud courses and typical rectilinear buildings. We were in Djenne by mid-day, soon checked into our modest room and taking a mini-foray into town. The “hotel” construction is typical of this town; mud brick covered with a mud skim coat. Variations between buildings take the form of decorative riffs and size variations. The old city of Djenne was originally located across the Bani River, and was founded in 3 BC. This site was continuously occupied until the 14th century, when it was moved to its present location. The city evolved from its inception into one of the most important trading centers in West Africa and was the geographical and cultural confluence of the animistic beliefs to the South and the Arabic culture and Islam beliefs to the North. Through Timbuktu may share some of the glory as a trading place, Djenne was a more important trading town and predates Timbuktu by 16 or 17 centuries. The site of the old town is a protected archeological site and the foundation traces of the old city are littered with centuries old pottery and human bones. Djenne’s move across the river started when the Muslims built a Mosque on the North side to separate themselves from the animists. Being traders and business men, trade and commerce naturally started to increase at the new city site. At some point in the 13th or 14th century, the original site was abandoned and the new town began to flourish. The urban fabric of Djenne is informal in quality, with serpentine streets and alleys leading to surprise squares and dead ends alike. The town seems to be organized around the main square and Mosque. Travelers to European towns with an intact medieval section and their similar city fabric will not be surprised. Not surprised, that is, except by the mud (vs stone) used everywhere as a building material. The layout of the houses, not just in juxtaposition with their neighbors, but in their internal layout, is exquisite. Most are courtyard homes and all have an intimate quality between interior and exterior space and between public and private space within the walls of the house. Many of the buildings are in varying states of disrepair, but that doesn’t stop the lively human interactions (this is Mali after all!). The courtyard is the heart of the house and most homes spiral up 2 or 3 floors with a walkway/arcade on at least one side of the court at each level. Tiles often line the floor and walls of the court and illustrate the layering of cultures from North and South. The sounds of kids and home life echo throughout and, if you have been reading this blog on a regular basis, you won’t be surprised that the sound of children is THE universal given here in this culture. Timbuktu …. what a mysterious place name. I first heard about Timbuktu as a little boy (watching cartoons and hearing Bugs Bunny talk about it was all it took for me to pull out the globe and find it) and it has taken me until now to get here. The wait was worth it. Picking up where we left off on the Niger, disembarking at the little port of Kabara , 8 miles from Timbuktu. Tuesday afternoon, January, 10, 2012 through Saturday, January 14, 2012. Eucalyptus trees lined the road into town. They are beautiful, but strange, if only because of my expectations. It was at the end of this grove, and the end of green, that I first glimpsed Timbuktu. “Of the Earth”. That’s about the best description I can come up with for this city. The mud architecture made from the surrounding earth, along with the pervasive and insidious sand and dust gives the place a monochromatic feel broken only the bright clothes of some of the people. Though the clothes are not as bright here as they are in Bamako or along the river, they are bright enough to bring contrast and relief to the eyes. The town has approximately 50,000 inhabitants and at least that many goats and chickens. The people, mostly Tomashek are hospitable and friendly, a far cry from the environs. This is a level 10 town; hardship is a way of life and life itself seems to be in a precarious balance with the Sahara. The town is named after Buktu’s well. “Well” in the Tomoshek language is Tim; hence the name Timbuktu. Founded as a permanent settlement in the 12th century, the town flourished as the center of trade (gold, ivory, salt and slaves) and wealth until the 17th century when it began a decline still in evidence today. The French took over in 1893 (hence the name Tomouctou on some maps) until Mali’s independence in 1960. It is currently the capital of the 6th administration region of Mali, it is dirt poor, and the Sahara’s advance is relentless. Centuries ago, the area was grassland and provided plenty of bounty for the populace; not so today. This town is now a tourist destination and seems to rely 100% on out of town dollars for it sustenance. Because of the world economy and the trouble with terrorism in the area, however, tourism is down. Everyone is hoping this festival brings a bit of money into the local economy, but truth be told, reports are circulating that only 150 foreigners are here, down from almost 750 last year. Our shelter while here is with the Deiy’s brother (a friend of Ibrahim’s). It is a house with a small compound flanked on the North and South sides with buildings each containing a few rooms. The room sizes vary, but are approximately 12 feet by 12 feet. This house is typical of the structures in the town; courtyard design, mud brick construction and austere by any standard. Unlike houses in other parts of Mali, it seems as if there is a lack of art and decoration throughout the city. The sand is everywhere and I finally know intimately the term desertification. There are a lot of us here: Jess and Terry, Erin, Tyler, Mikey, Sarah, Ibrahim, Joyce, Larry, and myself. All but Sarah are from Portland. It is a fun group, and a musical group at that. Our second night in town, Ibrahim took us to a house to listen to local music. An elder man played the ‘Ngoni, accompanied by Ibrahim’s gourd. It was an amazing show of hospitality and musical talent. Walking home in the moonlight was a treat; moon shadows filled the streets and masked the general disrepair of the place. Even more so than during the day, in moonlight there is a monochromatic quality to this desert life. It is textural and glowing cool silver rather than warm brown. When looking down on this place from Google earth, it is hard to differentiate between the Sahara sand and this tiny outpost of humanity. Food!Our first dinner was chicken with pommes frittes and onions; another dinner was fish with chips, onions, carrots, peas and plantains. Breakfast has been bread and jam and Alfinta, the Taureg version of Furu Furu described earlier in this blog. One of the more interesting dishes was something I think they called Tucas. Steamed bread in a sauce of cinnamon, onion, tomatoes, palm oil (the sauce reminds me of mole, but lighter) with beef chunks, plantains and potatoes. The bread was served in the dish, covered in sauce. Light and fluffy, it was almost a meat doughnut. At one point, we even had what was described as being similar to scotch eggs. I say described, because that happened to be the time when I went down hard with a stomach/flu bug and eating was not high on my priority list. We trekked from the outside of town and over a number of dunes towards the festival site. About halfway into our ride, we dismounted and climbed the dunes to the North. Within a few minutes I was looking into total emptiness. The dunes close to town were scrub covered, further to the North more bare sand than living foliage and in the distance, nothing but sand. Mounting our camels once again, we made our way slowly back to the tiny slice of civilization of the town. We went to the festival in the mid afternoon of the first day to get our tickets and check in. We hung out on the dunes until early evening then came back to the house for some dinner. I laid down for a little nap and woke up feeling terrible. Stomach pains and woozy, it was either the flu from my co-travels at the house, or a bit of bad food. Skipping the first evening’s entertainment, it was a 12 hour nap for this boy. Feeling better the next morning, I was able to walk the town and actually go to the festival. The music was great and I was back at the compound by 3am. To describe the festival would be to describe any multi-day concert. What makes this place different is the location. It was an unearthly walk back to the house from the festival site. The dust is thick, and constantly stirred up further by the hundreds of motorcycles and cars that make their way hourly to and from the festival grounds. The lights from the cars and bikes cast a moving gloom in front of them and the flashlights swinging from the tuobabs’ hands describe fuzzy orbits and bounces in the dark. The locals don’t often use flashlights, and it is only by the sand-muffled sounds that you know you are upon them, or they you. The glow for the festival grounds can be seen for miles, but is an indistinct glow, diffused by the sand and dust. During the day I mostly and explored the town. At the cyber café I met the young man on duty. He was a likeable, chatty fellow, 22 years old (the same age as my son Nick) and his dad is an architect in Timbuktu. So he started calling me his “father” and we’ve been exchanging emails since. It is cute, but it is also indicative of the culture here. The personal and societal space of these folks are, as we might expect, different from ours. Men hold hands with men, women with women, all walking arm in arm. They cuddle on the dunes not only for warmth, but in genuine affection. Conversations are held in a more intimate way than in the US; heads and faces held close. Laughter is prevalent and you see a lot of respect for elders. I experienced this a lot on the dune for the last concert night. A few Tauregs have become acquainted with us over the past few days and we spend time on the dune huddled for warmth, talking as best we can and listening to the great music. Normally, I would say “All too soon it was time to leave”. In this case though, it WAS time to leave the hardship. We packed up and left via the ferry at Kabara, bound for the other bank of the Niger and the jeep ride into the Sahara. Larry and the best little entrepreneur of the town. I think he was eleven years old. Buktu’s well. They built a museum in this location around the well. Me and the little entrepreneur. He’ll do well in life; I just know. Meet Ajua, my camel for the afternoon. His nose ornament looks like a spit cross hairs. I finally made it to the Sahara! We’re back from Soni Tieni (spelled Soninkegny by the locals) and I think that I have never experienced something quite like that. We arrived by mid afternoon of the first day and were greeted by the entire village. The mayor and elders headed up a receiving line on the road leading to the central courtyard. Wague and Ronna have been here many times over the past 18 years to help the village (education of the youth) and their arrival is always highly anticipated and generously celebrated. This time was no different as we were led to the school house (the first one built with the financial help of KoFalen) to deposit our gear and then taken to the village center where we were treated to dance and music (drumming and Balafon). I’ll talk about dance and drumming in the next blog; it was incredible. Who are we? There was Wague and Ronna with Penda and Amina their daughters; Tami and Hossein; Kathleen; Julie and Arvey; Larry; Joyce; Bani; Djanka; and myself. After the performances, Wague, Ronna and the board presented the school supplies to the headmaster, we unpacked our gear, set up our tents, and were treated to a dinner by the village. That night and the next were a gift to us with more dance and music. Our days were spent in community. This country is amazing in its social capital, and this village was a microcosm of that goodwill and joy. They showed us how to make Shea butter and we participated in all parts of the process, we walked through their gardens, and the “old growth” mango grove that was planted by the grandparents of the elders (I snuck back there and had a very contemplative hour alone in the shade and bare understory of a mature grove), we watched and helped with the blacksmith, and watched as Wague showed them how to build a two “burner” fire pit from rock and mud; a decidedly major upgrade from a three rock kettle stand. The kids followed us everywhere and loved getting their picture taken. I was able to document a small, but representational portion of the village structures, and at least one main compound. Between the sketches and the photos, I have a good start on the research I need to complete the design on the Cultural Center back in Bamako. Our time at Soni Tiene was over all too soon but the memories, and the life lessons, will last forever. New Year’s Eve saw us up early and prepping for our party. Kofalen invited a local Balafon and drumming group to play for us in the Mango grove. What a hoot! Most of the neighborhood showed up and I think we danced the entire afternoon. It was dusty and hot but nobody seemed to care. Children were everywhere! Towards the end, the drum leader started a call and response with all members of the Diakite family to sing praise and give thanks for the honor of playing. Since we are guests of Wague and Ronna, we were included in this. The dancing got even more raucous at that point. Earlier in the morning, Joyce, Larry and myself were all presented gifts of robes from Cissoko, the gentleman that changed our money our first day here. Much better than wearing jeans and short sleeve shirts to the dance! New Year’s Eve night was a quiet time and the rooftop of the center a great place to watch 2012 roll in.